Rising star Declan Rice is wanted by Real Madrid, according to “reliable source” via Scott Minto. Rice was recently capped by England boss Gareth Southgate after a string of impressive performances anchoring West Ham’s midfielder. 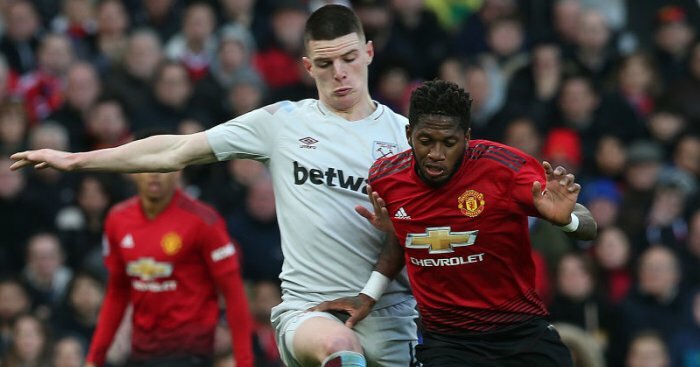 The 20-year-old put in another good performance against reported suitors Manchester United on Sunday, but Sky presenter and former Hammers left-back believes LaLiga giants Real are also chasing Rice. “I’m hearing that even Real Madrid are knocking on the door and speaking to his family. That’s what I’m hearing,” Minto told Stadium Astro following Saturday’s match. When pressed on his where he had heard this information, Minto added: “I’m not going to say. But it’s a reliable source. “West Ham I’m sure know about the potential he has. “Man United will be knocking on the door. Rice has been transformed from a centre-back to a holding midfielder and his performances have apparently caught the eye of United scouts. Manchester City have also been credited with an interest in Rice, who finally penned new terms with West ham in December on a contract until 2024 with the option of a further year. Rice was only on around £3,000 a week before he signed the new deal which is believed to have seen his salary increase 10-fold, but just four months on, such is his stock that now looks to be under-valuing the player.